Jazz up your guacamole with this quick and easy idea for a cauliflower base that looks strikingly like a real brain (it just might fool the zombies!). It takes less than 15 minutes and at your next party the zombies, errrr, guests, will be impressed by this inventive recipe and presentation! Recipe has been slightly modified from the one posted on All Recipes. Either make your own guacamole or get the store-bought stuff (which I prefer for parties, as it doesn't brown as fast as homemade). In a small bowl, mix in the salsa with the guacamole. Take the cauliflower head and remove the leaves and main stalk, which should leave a nice hollow area to place your guac/salsa mixture. Use toothpicks to hold it together if it starts to fall apart. Use toothpicks and red and blue food coloring to paint "veins" onto the brainy-looking cauliflower. You can either plate the cauliflower like the photo above, or you can place the cauliflower in a small bowl for stability. 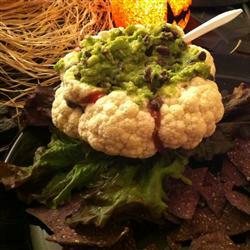 Fill the cauliflower with the guac/salsa dip, dribble a little salsa around for blood and voila...brain dip fit for hungry zombies! You could also just use a mix of salsa and cream cheese or sour cream (there are vegan versions of these too!) if you wanted a bloody brains look. Oh my gosh, I love that!